FERNANDO MONTIEL: "WE'LL SEE HOW GOOD HE IS AT 118"
"I think he is a good fighter, but I think he was better at either 112 or 115. We'll see how good he is at 118 and that will show in the ring," stated WBC & WBO bantamweight champion Fernando Montiel as he spoke to the media during a conference call to promote his upcoming February 19th showdown with Nonito Donaire. Check out what he, Donaire, and all the participants had to say. the Philippines and Mexico  there is almost frenzy about this fight. I was informed last night that in the Philippines there are two one-hour specials promoting the fight and they are expecting a huge audience on Sunday morning, which is their time equivalent of when the fight will be aired. In Mexico there is tremendous anticipation and great media coverage. The Mexican TV network, TV Azteca is expecting another tremendous rating for this fight. It is my hope that the enthusiasm that is coming from The Philippines and Mexico permeates in the United States, that people that follow boxing and casual sports fans watch this fight on HBO because it truly will be a fight for the sport of boxing. It is accompanied by a great fight, a rematch between Jesus Soto Karass of Los Mochis, Mexico and Mike Jones of Philadelphia. I am proud that Top Rank can present such a splendid card and thanks to the two fight camps that are willing to engage in this climactic battle. CAMERON DUNKIN: This is a tremendous fight and what Nonito has worked for his entire career. I am so proud of everybody for putting this event together. I want to thank Bob for holding this together and pulling together the Anaheim fight. We are so thankful and don't miss it. It's going to be a great fight. ROBERT GARCIA: I am happy to be a part of this big fight. It's the first big fight of the year in Vegas and Nonito is in tremendous shape and I am happy to be a part of his team. BOB ARUM: The face of boxing today is Manny Pacquiao and he comes for the Philippines. But right behind him in the Philippines is a man who comes from the same city as Pacquiao, General Santos and is becoming more and more endeared to the Philippine fans. There is tremendous excitement for his fight on the 19th. He's a great fighter, a tremendous technician and a hard puncher. It is a pleasure to introduce the champion  both guys are champions  Nonito Donaire. NONITO DONAIRE: Thank you, Bob, for making this fight happen. This fight is going to be an incredible fight. I have great people around me and I'm training very hard for this fight and I'm really ready. Robert Garcia has been in my corner. This is an all-or-nothing fight that no one can miss. It's a great card and you have two guys in the main event that are willing to give everything. This is a fight that's not going to last the whole 12-rounds. How are you handling the move up in weight? NONITO DONAIRE: In the last fight with Sydorenko [at bantamweight] I felt stronger and faster. Mainly in the last two weeks of camp I'm usually cutting down [weight], actually three weeks I am focusing on cutting down but this time we are focusing on strategic moves and not having to worry about the weight too much. Like Manny Pacquiao going up in weight  he feels very comfortable. I feel strong. I look bigger and the speed is still there. I was 10-years-old when I moved to the United States. Do you feel you should have moved to bantamweight a few fights ago because you looked so strong? NONITO DONAIRE: It was a learning experience on my part, being a man of my word waiting for the rematch with Darchinyan. I stayed around quite a bit. I learned that I don't have time to wait for one guy; there are plenty of fighters out there. That's what I should focus on. I am trying to seize these moments, like this fight with Montiel. I need to make things happen and not wait around. Is your goal to go to higher weight classes to keep winning titles? NONITO DONAIRE: I think so. For me it keeps me going and keeps me motivated. It keeps me hungry to fight better opposition. I am mentally prepared because of it. Right now I am not even touching the weights and I am blowing up to 135 if I don't take care of myself for even just a few days. I think I can fight as heavy as 130 or 135 because of how much bigger I have become. How much does Manny inspire you? NONITO DONAIRE: He is definitely an inspiration in my career -- an inspiration in boxing and how I want to be. I am inspired to see no impossibility. To get to 130 pounds or even more. To keep going. That's what he wants me to do, keep moving my feet to see how far I can go. Does the weight and experience give him an advantage? NONITO DONAIRE: It does give him advantage. He knows the ring well. His advantage is height and speed. I think I am a better strategist than Montiel. Everybody has their flaws and strengths and Montiel's strength is experience but I also have my strengths. His other strength is his ability to adapt to styles  he can be versatile. He has a tremendous punch  a good body punch. But in terms of strength  I have it. In terms of experience  he does, but I have fought enough guys to say I do also. He has a good punch, but I also have that. How have you improved your strength at the higher weight? NONITO DONAIRE: I am naturally strong and naturally fast. I get in tremendous shape. I have a guy that strengthens my legs and a guy that strengthens my core. People making sure I and eating the right foods and Victor Conte and the main guy behind me is Robert Garcia. I have different aspects of healing my body and strengthening my body and that's how I know I am 200% ready for the fight. How often do you get back to the Philippines? NONITO DONAIRE: I usually go back there after every fight to say thank you for all the support you have given me. The people have received me very well. They have noticed what I have done for boxing and the country. They are very warm to me and it is a blessing. Can you tell us why you say this will be your last fight at bantamweight? NONITO DONAIRE: That depends on my manager and promoter. I would rather see myself become undisputed world champion. There is also a chance in the 122-pound division and I am willing to move up. I could be the first undisputed world champion from Asia. I trust Cameron Dunkin's decision to lead me n the right path. After Montiel I will have two belts with one more to go to accomplish the dream I have wanted since I was a young boy. What will this fight do for your stature? NONITO DONAIRE: I think Montiel is the most complete fighter I will have faced. This is the biggest fight of my career. Montiel has been there for quite a while. People say he may be shot because he has been fighting for such a long time, but no, he has been fighting guys at the top of his weight class. I know he is up there and capable of anything. I am training as hard as I can too see how I can take advantage of Montiel. He has a lot to offer in this fight. This is going to be more of a strategic fight. He's the smartest guy I have ever faced. I have faced tougher guys than that. As far as the smartest I would say he is the most strategic overall fighter I will have faced. It's going to be a long fight. One mistake from me or one mistake from him and it's going to be over. He may come out of there unscratched but it won't last 12-rounds. What will this victory mean to you? NONITO DONAIRE: My marketability will skyrocket. My name will get bigger and I will get bigger fights. People will come after me because that's what happens when you're on top. My name is in the top pound-for-pound lists and no one can take that away from me after I beat Montiel. Why do you think your career has been slow to develop after the Darchinyan fight? NONITO DONAIRE: Everybody was shocked. The whole world was shocked. Promoters were shocked. People wondered if it was a fluke or not but I have been fighting and every guys they have put in front of me I have defeated. This is the opportunity I have gotten since I am on top and I am very grateful for it. Now I have to make it happen. I do have the talent and I make it exciting for everybody. Are you friends with Montiel? NONITO DONAIRE: When I fought for the NABF title we were friends and trained together before we turned pro. That taught me a lot. This time I know how it feels. When you are in there, there is no one else but you and your opponent. That person in front of you is a wall you need to jump over. That's the way it is with Montiel regardless if he is a friend of mine. I'm going to go over there and tear his head off. If successful, what is next? BOB ARUM: Like always we will sit down with Cameron and Nonito and discuss the so many great options. To stay at bantamweight and fight the winner of Mares and Agbeko or off to 122  we have two 122 pound champions  Stevie Molitor and Miguel Vazquez from Puerto Rico and he's going to keep moving up in weight. We have killer featherweights  Juan Manuel Lopez, Yuriorkis Gamboa. We have fighters for him to fight to make exceptional fights, all the way up through 135 pounds. On the Pacquiao card we have Soto against Antillon  a fight-of-the-year rematch and Brandon Rios is going for a title on Showtime on Feb. 26. So there is plenty of great competition for him. Do you think you have the opponents to make Nonito a superstar such as you did with Pacquiao? you can't duplicate but you forge your own story and that's what Nonito is in the process of doing  whether it resonates as much as Pacquiao or Leonard or one of these other guys  that remains to be seen. He is trying to create a great story for himself and his career. Is Nonito ready to handle the attention? CAMERON DUNKIN: He walked in against Darchinyan and no one gave him a chance and even his promoter didn't give him a shot in hell to win that fight. He shocked the world and was winning every round pretty easy and then he destroyed him. SO he has had his back against the wall before. He's had a great amateur career and has continued to get better and better. I think it's his time. He's not a young guy as far as the lighter guys go but he is still young and healthy because he hasn't had those hard fights. He is the best he can be and I see him doing unbelievable things in boxing starting right here. He is very levelheaded, all he does is train and sometimes Robert calls me and says he trains too much. It's his time and this is what he really wants in his life. How did you and Montiel become friends? NONITO DONAIRE: We have respect for each other; I think that's what it is. We see each other at fights and who our respect and it turned into a friendship. It wasn't just Hi, it was how you doing and we talked about fighting each other, but in a friendly way. Do you need to or will it be hard to develop a hatred for this opponent? NONITO DONAIRE: When I spar I don't hate those guys but I hit them as hard as I can. It's going to be in that same fashion where I look up at him and my hands are strong and I'm going to hit him as hard as I can. Right now I have the right guys behind me. Robert inspires me to be more confident. He gives me heart and energy that I need to fight. Like a Pacquiao heart or if you are Mexican he gives you Mexican balls. ROBERT GARCIA: He works hard and in his last fight in December against Sydorenko I was impressed, I came into the camp 3 weeks before the fight it was impressive to see him spar 12-rounds and to step out of the ring smiling where most fighters are mad and tired. He made it look so easy against Sydorenko people thought Nonito was fighting a bum to get ready for Montiel, but no, he was an Olympian and two-time world champion. That's how good Nonito is. I know Montiel is a great fighter and very experienced and I admire his work and we can't take him lightly. But it could turn into a fight that just goes our way without a problem. It's not hard to work with Nonito when he wants this fight so bad. If I have to leave camp for a couple of days I have no problem with that because I know he is training hard. BOB ARUM: The rematch of the great welterweight fight that took place in Dallas in November between Jesus Soto Karass and Mike Jones will also be televised on HBO. Another great welterweight fight that won't be on HBO but on the international telecast will be Mark Melligen of the Philippines and Gabriel Martinez of Mexico, which is another splendid match. Those four welterweights are as good as anyone and better than some of the dribble that are getting paid seven figures by the network that is televising this event. Also Mike Alvarado, a 140-pounder who has been in camp is on the card and if successful you will see him again on April 16 on Showtime on the Juan Manuel Lopez card. Another jr. welterweight, Mickey Bey, undefeated in 16 fights, will be on the card. Finally there is a fighter from Cuba and his name is Udenis Ugas, undefeated out of Miami, FL  he is one of the most exciting welterweights you have seen. We can't predict greatness from him yet because he's only had 5 fights. But come early and watch him fight because he is going to be something special. It is a great card and I think the main event will be a candidate for fight-of-the-year. Thank you Nonito and Cameron and now we go to Fernando Montiel. BOB ARUM: Fernando Montiel is one of the most popular fighters in Mexico and someone I have enjoyed watching boxed over the years. He is also very popular in the LA area, having boxed numerous times thee. He is a terrific young man, a great champion and we're very proud to be promoting him on this card. One of the great warriors, Fernando Montiel. FERNANDO MONTIEL: We had a real good camp and just did a 12-round test that we passed with flying colors. I feel really well and the hardest part of training is done. Now we are just working on our speed and getting ready for this big fight and I can't wait for it to happen. How significant was it for you to go to Japan and win that title? that opportunity was there and I took it. I showed the level that I was at. It was one of those wins that puts you at another level. Would a win here put you on another level  a win against 2 elite fighters back-to-back? FERNANDO MONTIEL: When the name came up. Mazawa, and I beat him the fight against Donaire became very real. Before that there were some doubts about whether I could get that fight which for me is great. I do want these kinds of fights, I do want to be known and I do want to be the best. You were on HBO once and what do you think took so long to get back? FERNANDO MONTIEL: That first fight against Gonzalez I think was a question of styles. We just couldn't get together. His style and my style could never match that night. It was a difficult fight for both of us and we each wanted to show something and it wasn't possible. After the fight I heard the criticism and thought I needed to do something about it and I did. I changed my style and became more aggressive. I wanted to give people a better show  a better fight. I think I have done that. My style is better and it has shown in my fights. Now I get another opportunity on HBO and I'm not going to mess it up  I'm going to do real well. How will your friendship with Donaire impact the fight? FERNANDO MONTIEL: Outside of the ring we are friendly and are going to be friends. We have a lot of respect for each other. But inside the ring everything changes. We are very competitive. We both want to win. We both want to do our best. No mercy. You go in to win the fight and forget about everything else. When the fight is over you become friends again. FERNANDO MONTIEL: He did impress me. He looked really great against Sydorenko but I'm not Sydorenko. Sydorenko just stood there in front of him and I think you have to take that into consideration too. I am not going to be standing in front of him. I'm going to be moving around and I'll be doing my job too. I thin our styles match real well and it's going to be a good fight. What will you bring that maybe Nonito has not seen before? 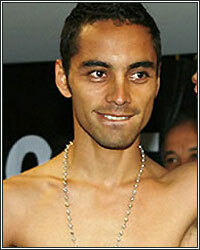 FERNANDO MONTIEL: He is obviously a fighter that has a lot of speed. He moves around the ring and is an intelligent fighter. The question to me is what is going to happen when he fights a guy that is just as intelligent, just as strong and just as good as he is. That is the question  when he fights someone that is equal to him. I think it's the first time he will find a fighter that is just as good as he is. Have you heard you're the underdog? FERNANDO MONTIEL: The people that come up to me are just like you guys. They think it is a very tough fight and it's up for grabs. Either guy can win and a lot of people think I can lose this fight and I'm the underdog. But to me that's not a problem. I believe I'm going to win this fight and that's what I'm going to do. Do you see a strategic fight or a fight ending in one punch? FERNANDO MONTIEL: You have to fight smart but I am here to entertain too. I want people to go in there and say that is a fight that they will remember for a long time. If we need to break into a war, let's do a war if that's what needs to be done. But it is certainly not going to be a boring fight. Are you willing to take a risk -- unlike the Bradley-Alexander fight? FERNANDO MONTIEL: For sure I am ready to risk getting knocked down and getting back up and knocking him down and him getting back up. I want it to be a great fight so everybody can remember so maybe we cannot do only one but maybe 2 or 3. What are you most worried about in this fight? FERNANDO MONTIEL: I think I have the experience to do anything up in the ring. One thing is his speed but we have worked hard in training camp to nullify that speed. I think we've done that and we'll be ready for it. Are you worried that you haven't fought many rounds  you've been knocking people out lately? FERNANDO MONTIEL: To me that is not important. I train to fight 12 rounds. I am in the gym the whole time working to get ready for a fight. I know I have the power to knock a guy out in the 1st, 2nd or even the 12th round. It just depends on the opponent and how hard you need to do it. Now it looks like there is a new rival between Mexico and the Philippines. Do you feel that is important part of the fight? FERNANDO MONTIEL: I know the rivalry is getting better as their fighters are getting better. There is a little extra motivation there. I think both countries, the Philippines and Mexico want to see their guys win. They are both behind their fighters and a victory for either side would be important. FERNANDO MONTIEL: I think he is a good fighter but I think he was better at either 112 or 115. We'll see how good he is at 118 and that will show in the ring. Nonito has been looking to fight you for a couple years  do you see it the same way? FERNANDO MONTIEL: I have been following his career and once he beat Darchinyan I kept my eye on him knowing the opportunity may come up. I think this fight is a fight that I need and a fight that I want. BOB ARUM: I would like to thank everyone for being on this great conference call. As always in these tough economic times, we have kept prices very reasonable from $25 to $250. We plan on having a large crowd and if you can't make it there in person, make sure to watch it live on HBO. Montiel defends his title against Donaire in the latest chapter of the storied México-Philippines rivalry, Saturday, February 19, at Mandalay Bay. Promoted by Top Rank, in association with Zanfer Promotions, the Montiel-Donaire world title tilt will be televised live on HBO Boxing After Dark, beginning at 9:45 p.m. ET/PT (delayed on the West Coast.) The broadcast will open with undefeated NABO/NABA/WBC Continental Americas welterweight champion MIKE JONES defending his titles against Top-10 contender JESUS SOTO KARASS in a rematch of their exciting battle which took place on November 13 on the Manny Pacquiao-Antonio Margarito pay-per-view extravaganza. Montiel (43-2-2, 33 KOs), of Los Mochis, Sinaloa, México, is only the fifth Méxican fighter to win world titles in three different weight divisions, joining Hall of Famer-elect Julio César Chávez and future Hall of Fame inductees Erik Morales, Juan Manuel Marquez and Marco Antonio Barrera. Undefeated since 2006, eight of Montiel's last 10 victories (eight were world title fights) have been by stoppage. Donaire (25-1, 17 KOs), a native of General Santos City, Philippines, now living in the Bay Area of San Leandro, Calif., enters this fight riding a nine-year, 24-bout winning streak, which includes an IBF/IBO flyweight title knockout victory over defending champion Vic Darchinyan, and a fourth-round blasting of former WBA bantamweight champion Wladimir Sidorenko in his last fight on December 4. Nine of Donaire's last 10 victories have come by way of knockout. Remaining tickets to Montiel vs. Donaire, priced at $250, $125, $50 and $25, not including applicable service charges, can be purchased at all Ticketmaster locations (select Smith's Food and Drug Centers and Ritmo Latino). Ticket sales are limited to eight (8) per person. To charge by phone with a major credit card, call Mandalay Bay at (877) 632-7400 or Ticketmaster at (800) 745-3000. Tickets also will be available for purchase at www.mandalaybay.com or www.ticketmaster.com.